Description: The Tree of Life is a popular historical symbol that represents strength and wisdom. It also refers to the connection of all forms of life. Health, longevity, and eternal life are often associated with this unique design. 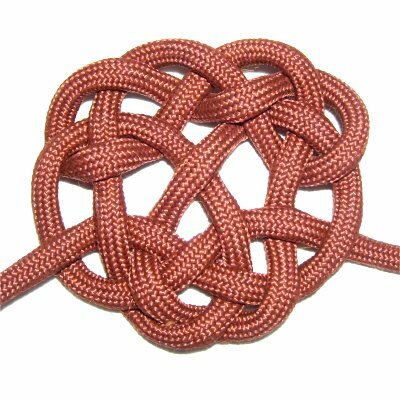 You can use this decorative knot as a pendant, or a focal point for a Macrame bracelet. By making it large, and using a second cord to double it, you can create a nice set of coasters or a table decoration. In the example shown, nylon Paracord was used. It needs to be melted with a flame at the tips, to seal in the fibers forming the core. Click on the link or image to see his website. The video gallery contains other innovative Fusion knots, which are a combination of different knotting elements and techniques. 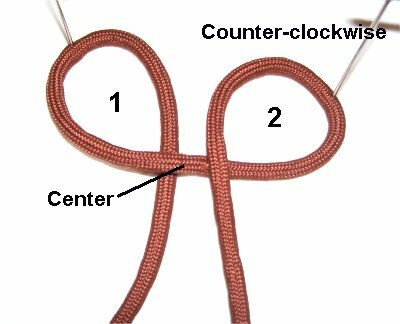 Step 1: Make a counter-clockwise loop near the center of a 45-inch cord. The left portion should be horizontal, and pass over the right to make the crossing point. 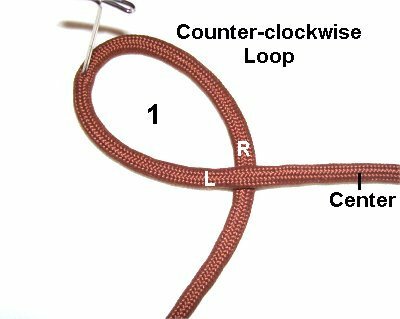 Step 2: Create a second counter-clockwise loop, positioning it to the right of the first. 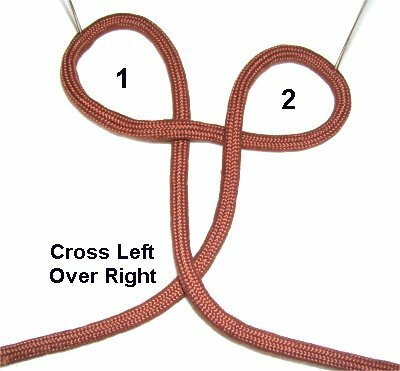 Step 3: Cross the left end over the right, below the two loops. Step 4: Turn the knot around, so the two ends are at the top. 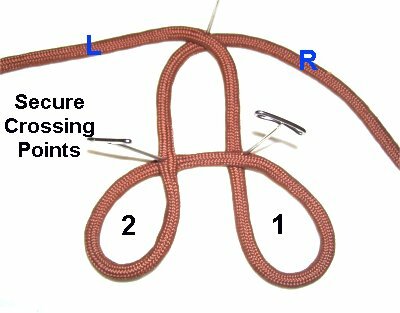 Secure the crossing points of the two loops as well as the ends. Step 5: Bring the end now on the right straight down, passing over Loop 1. 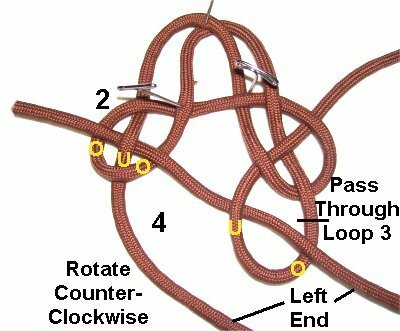 Rotate it clockwise, to form the third loop. 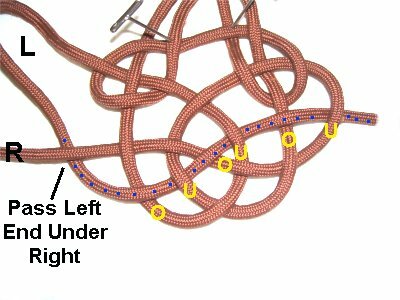 Weave it through Loop 1, under - over - under the three segments. Step 6: Bring the end on the left straight down, passing under Loop 2. 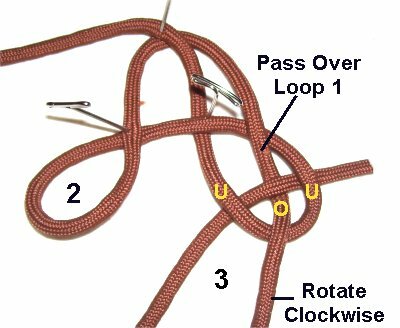 Make Loop 3 slightly larger than the other two loops, since you will now be creating the lower portion of the Tree of Life. Step 7: Bring the left end to the right, and pass it through Loop 3 over - under (from the top). Bring it back to the left, to Loop 2. Weave it over - under - over the three segments, to make Loop 4. Push Loops 3 and 4 towards the center, creating a third space. 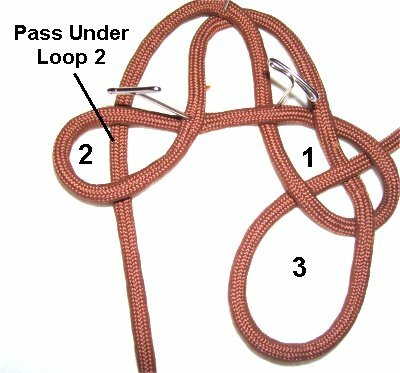 Step 8: Pass the right end through Loops 3 and 4, moving horizontally (right to left). Weave it under - over - over - under the four segments. Step 9: Pass the left end under the right end. Weave over - under - over - under - over - under the six segments (loops 4 and 3). The left cord is marked with small blue dots so you can see it better. 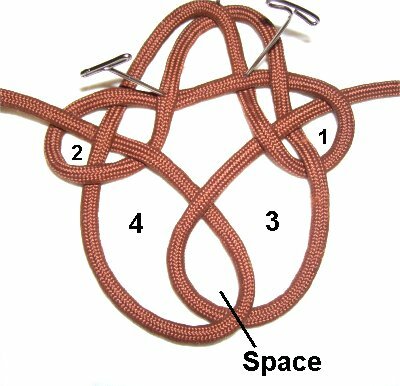 Step 10: Stretch the knot so Loops 1 and 2 are near the top, and there is space between the bottom and top areas. 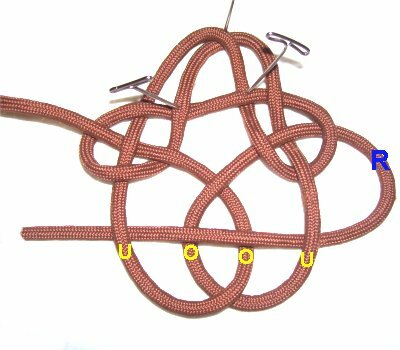 Start at one end and remove the slack as you go through the entire knot. The ends will be at the bottom of the Tree of Life when you are done. Have any comments about the Tree of Life? Contact Me.